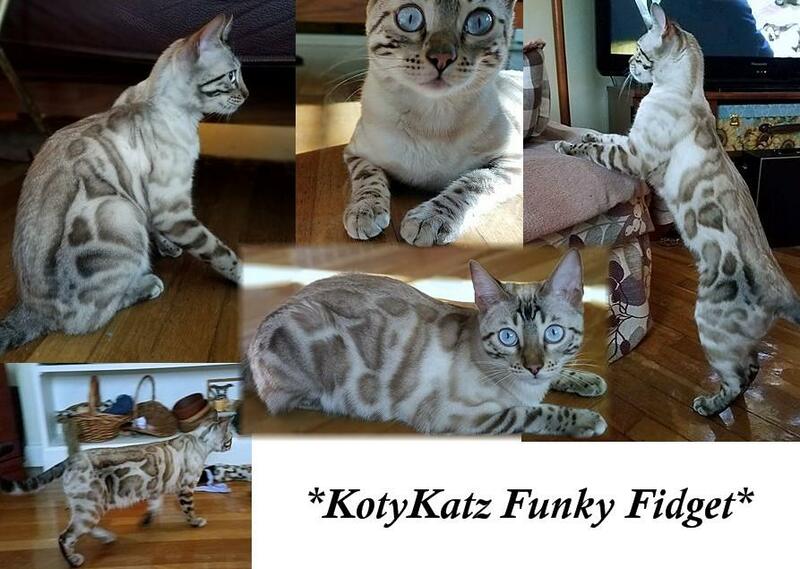 KotyKatz Funky Fidget is not only a gorgeous Seal Lynx Point Bengal, she’s also the perfect mix of personality. I love how she is constantly keeping me on my toes with her shenanigans. I think sometimes they wrote the saying curiosity killed the cat for this girl in particular. She constantly is investigating….everything!! Fidget has been UC Davis color tested and is a carrier of both Apb and also A2, both inherited from the Asian Leopard cat. Another thing that Fidget carries for is Dilute (Blue). We have a feeling we’ll be seeing some VERY interesting offspring from our Fidget! If you’d like to see Funky Fidget’s pedigree, please click here. This entry was posted in Gallery, Queens and tagged Bengal Queen, seal lynx point. Bookmark the permalink.